People can be much more effective by asking than by telling. This is all about the gentle art of asking instead of telling. Relationships are the key to good communication, which is vital to task accomplishment; and humble inquiry, based on here-and-now humility, is the key to good relationships. Too often in companies when we interact with people – especially those who report to us – we simply tell them what we think they need to know. This shuts them down. Instead we need humble inquiry. We must become better at asking and do less telling in a culture that overvalues telling. In particular in the USA, task accomplishment is valued more than relationship building. The culture of tell prevails, and asking questions is seen as a sign of ignorance or weakness. But asking is actually a strength rather than a weakness because it provides a better chance of figuring out what is going on before acting. 1. Basic humility: usually generated by societal norms, such as class or respect for elders. 2. Optional humility: feeling humble in the presence of those who have clearly achieved more than us. 3. Here-and-now humility: how I feel when I am dependent on you. This is crucial to humble inquiry. My status is inferior to yours at this precise moment because you know something or can do something that I need in order to accomplish some task or goal. 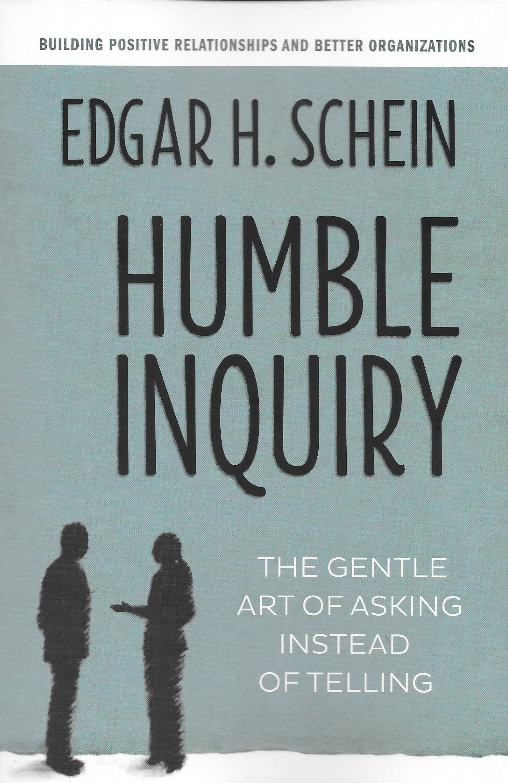 Humble inquiry: accessing your own ignorance in the least biased and threatening way. Diagnostic inquiry: not telling, but steering the conversation and influencing the other person’s mental process, through asking about feelings, reactions, causes, motives, and actions they have taken. Confrontational inquiry: inserting your own ideas in the form of a question. In summary, the key to coordination is shared goals, mutual understanding of each other’s work, and mutual respect. This is helpful advice, but don’t expect too much of a rigorous method. There are plenty of examples, but you will need to work out your own style of humble inquiry.